Columns by Lawrence Cooper Jordan, Jr.
n the blink of an eye, the sportsmen dropped the fishing rods and took up the shotgun. 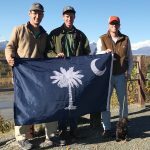 Duck season was to open on the Saturday before Thanksgiving and whether or not they had been scouting, hunter’s would fill South Carolina’s swamps, lakes, and rivers in the morning to come. 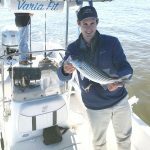 Since our first striper fishing expedition launched back in December ’15, we have seldom encountered schooling striper on Lake Moultrie. The 4-Runner was stuffed with a week’s supply of gear and only the dog had space to relax. 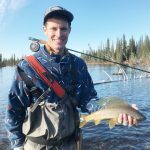 Since my college friend Andrew Case made his move to Alaska with the Army, we had been in discussion about making a trip to visit and see the last frontier. 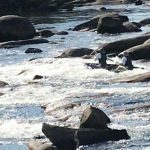 While the striper remained in the cold water of the Saluda River for spawning, Dawson Jordan, Ryan Stephens, and I planned a mounted canoe trip to test our luck against the fish. After hearing reports of striper action on the Wateree River, Dawson Jordan and I wasted no time in planning a trip to catch some. 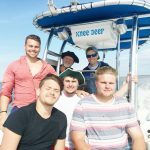 Several years ago when we had our offshore fishing boat, Cooper Jordan, Thomas Jordan, Dawson Jordan, Ryan Stephens, and I planned a trip to Georgetown to fish in the Gulf Stream. I haven’t launched the skiff in Georgetown since the fall and was glad to be back in the East’s most remote section of coastline. 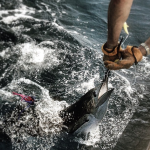 Fishing can be as complicated or as simple as the fisherman makes it. People have special knots, floats, weights, rigs, and lures that they believe in. The basic rules are that fish like structure and that live, natural bait is usually better than artificial bait. This winter brought bitter cold weather to Dillon County. The weather was a frequent topic of complaint except from the duck hunters.